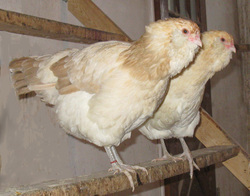 Our wheaten Ameraucana chickens came from John Blehm in Michigan in 2010. They lay a good smaller pale blue egg. They age to a green after a few hours. I find they are not quite as vigorous as the lavender ameraucana and expect hatch rates will be better for the lavenders. Their temperament is sweet, and cuddly. They are quietly friendly, not pushy or rough. They silently approach for a cuddle and are very attentive. They are the most beautiful chickens we have and their cold hardiness and excellent foraging, and beautiful eggs means they are a favourite here.